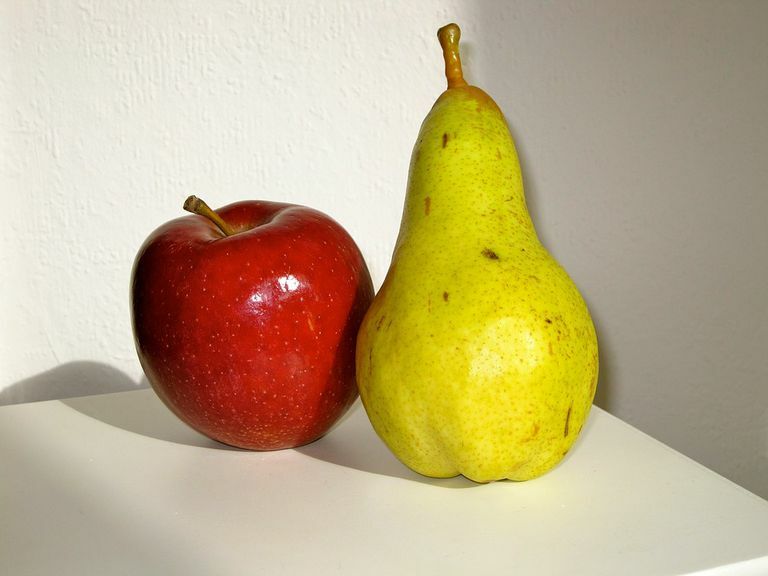 Whether you start out as an "apple" or "pear," your overall body shape will likely change as you age. This metamorphosis is due to several factors that fall into two main categories: those you can’t control, and those you can. In particular, the rate of these changes is closely connected to lifestyle factors like exercise, smoking, and diet. That said, your body is mainly made up of several components, primarily bones, muscles, fat, and water. Changes in body composition (the relative proportion of weight made up by each of these components) typically happen with age even when there’s no overall change in body weight. Generally, the amount of fat you carry increases as you age, while muscle mass, lean tissue, and bone mineral density decrease. Over time, natural fluid loss in your cells alters the tissues and structures they form inside you. These changes, in turn, can cause visible changes to how your body looks (and feels). Your total body weight fluctuates according to the number of calories (energy) you consume relative to how many you burn. If you take in more than you burn off, over time, you’ll gain weight; your body stores that extra energy as fat, rather than using it to fuel muscle. When this happens, the proportion of body weight you carry that is fat increases. It's also important to note that muscle is more metabolically active than fat tissue, so it burns more energy. Any loss of muscle mass due to age can, over time, shift body composition and further accelerate fat gain. Using a few quick measurements, you can calculate your approximate body fat percentage. It's not just the proportion of fat that changes over time—its location changes, too. In women, the drop in estrogen levels that comes with menopause coincides with a shift of fat storage from the lower portion of the body (a "pear" shape), toward the midsection (an "apple" shape). This belly fat is comprised of both subcutaneous fat (under the skin of your abdomen) and visceral adipose tissue (fat that accumulates around organs deep within the abdomen). Belly fat creates an apple-shaped form that has been associated with a higher risk of cardiovascular disease and type 2 diabetes. A 2008 review by researchers from the National Institutes of Health (NIH) and Harvard University looked at data from more than 44,000 women in the Nurses’ Health Study over a period of 16 years. It concluded the women with greater waist circumference were more likely to die of heart disease and cancer than women with smaller waists. Specifically, the women who had a waist size greater than 35 inches had approximately double the risk of heart disease and cancer compared to women with a waist circumference smaller than 28 inches. A more recent review in The Lancet looked at health outcomes in over 221,000 people in 17 countries and found blood pressure, lipid levels, and diabetes history to be more reliable predictors of cardiovascular disease than body shape. Still, the NIH recommends a waist circumference no greater than 35 inches for women and no greater than 40 inches for men. In men, the drop in testosterone levels that occurs with aging likely affects fat distribution and hip circumference, both of which commonly decrease as men get older. Both subcutaneous and visceral fat can be reduced through diet and exercise. To help prevent accumulating fat in your midsection as you age, maintain a healthy weight. In healthy adults, skeletal muscle accounts for about 40 percent to 50 percent of total body weight. As you get older, loss of muscle tissue and strength (sarcopenia) results from decreased activity. Some researchers estimate that after age 30, adults experience a 1 percent loss of muscle mass each year. Muscle burns more calories than fat, so having a smaller proportion of muscle on your body has implications for your overall weight and health, contributing to an overall loss of strength and increased disability. To maintain muscle mass as you get older, remain physically active and be sure to include resistance exercise in your regimen. Even seniors in their 80s and 90s can gain strength through mild resistance training. Not only can you get wider as you age, you also may get shorter. According to the NIH, this age-related body change is common in people of all races and sexes. Your bones make up about 20 percent of your total body weight. Due to changes in bone mass, as well as in muscles and joints, a height loss of about 0.4 inches (1 cm) every 10 years is typical. After age 70, the loss accelerates. All told, an adult can lose between one to three inches in height over their lifetime. Bone mineral density peaks around the age of 30 and typically diminishes from there. This is especially of concern for women in the first years after menopause. Having low bone mass puts you at risk for bone-thinning diseases like osteopenia and osteoporosis. You can help reduce lost bone density by avoiding tobacco, consuming adequate calcium, and including weight-bearing exercises like resistance training in your activity plan. Marie-Pierre St-Onge and Dympna Gallagher. Body composition changes with aging: The cause or the result of alterations in metabolic rate and macronutrient oxidation? Nutrition. 2010 February; 26(2): 152–155. doi: 10.1016/j.nut.2009.07.004. What Should You Weigh Based on Your Height? Do You Know Your Body Fat Percent?